We know your industry and what sells because we are thought leaders in the accounting industry. Our triple-crown approach includes great marketing copy, the latest web technology including mobile, and professional design images for a polished look. We include search engine optimization in all of our packages. Our sites have paid back for clients in as little as a week. Accelerator Websites is a division of Sandra L. Leyva, Inc. that provides done-for-you websites customized for professional services firms that you can update yourself or hire someone to update for you. We provide standard packages to meet your needs as well as a host of add-ons. Our sites have paid back for clients in as little as a week, and one site recently received leads even before it was completed. We know your industry and what sells because we’re one of you. Our strengths including writing great marketing copy while providing a professional image with the latest technology that’s easy to use and bug-free. We customize the parts of your web site that matter so that your strengths and uniqueness are clear to prospects. We excel at putting ourselves in your clients’ shoes: we know what they want, and we deliver. We know how to optimize your site for the search engine rankings, and we’re good at it. All web design projects are personally supervised by Sandi so that you know you are getting the best of her experience. Don’t worry if you don’t know where to start, how your email works, or what to do about your domain name; we’ll answer all of your questions and walk you through the entire process to make it the least time-consuming while producing the best result for you. Our ideal client is someone who wants to focus on their core business while outsourcing their digital marketing strategy to us. We love working with you to set your goals and achieve or exceed them with the budget you’ve set. Sandra L. Leyva, Inc. is a Texas corporation with offices in San Jose, CA and Plano, TX. Other divisions include Accountant’s Accelerator, Accelerator Newsletters, and Accelerate Small Biz. Sandi Leyva, CPA, is the founder and owner of Sandra L. Leyva, Inc., which includes three divisions: Accountant’s Accelerator, offering marketing and practice growth training and speaking; Accelerator Websites, offering done-for-you digital marketing; and Accelerate Small Biz, connecting small business and accountants through advisory training. 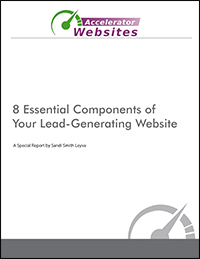 Sandi has helped thousands of CPAs, EAs (IRS Enrolled Agents), bookkeepers, QuickBooks consultants, and accounting software resellers get more business through her marketing strategies, web site and copywriting formulas, and millionaire mindset. More than 100,000 people have read her books and articles, used her training and coaching tools, or heard her speak at conferences. Sandi was named one of the Top 25 Thought Leaders for 2017 and one of the Most Powerful Women in Accounting by CPA Practice Advisor. She won a 2013 Stevie Award for “Maverick of the Year” and is a member of the prestigious Forbes Coaches Council. Her work has been noted by Forbes, CBS News, PBS, Dallas Morning News, San Jose Mercury News, Accounting Today, Journal of Accountancy, Today’s CPA, and The Practical Accountant. She is a regular contributor to CPA Trendlines. Sandi is one of a handful of women in the world who has copiloted a tiny six-seat, single-engine airplane over the oceans and around the world. Her book, Following Amelia: A Modern Day ‘Round-the-World Flight, describes her death-defying adventure along with the two award-winning humanitarian trips she managed to fit in along the way. Sandi has earned several marketing-related certifications. From Google, she has earned certifications in AdWords Fundamentals, Search, Display, and Mobile, Analytics Individual Qualification, and Digital Sales Certification. From Digital Marketer, she has completed certifications in Facebook paid traffic, conversion funnel, analytics, and search marketing. Sandi has authored several books, CPE courses, and over 1,000 articles for clients such as Microsoft, Intuit, and the American Institute for CPAs. Prior to starting her business in 1993, Sandi served time in two Fortune 500 companies. Sandi earned an MBA, holds a CPA in Texas and California, and earned an MS in neuroscience. She is an avid traveler and has visited 100 countries, including a backpacking trip alone around the world. Her volunteer work in Kenya, Russia, and Nepal earned her an AWSCPA Public Service Award and a Baird Community Service Award. In her spare time, she enjoys gardening, hiking, and spending time with family. 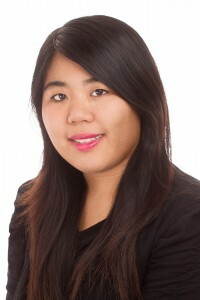 Annie Tao is our resident writer, web developer, and social media guru. She does most of our clients’ site updates as well as the back-end technical SEO to get sites to rank higher. She also takes care of writing and posting our clients’ social media content. Annie is detail-oriented, a fast learner, creative, and technical. She has experience with WordPress, CSS, several programming languages, writing content, and advanced graphics software. Annie earned a BS at University of California, Davis, double-majoring in Computer Science and Pharmaceutical Chemistry. Annie speaks Cantonese and Mandarin. Tofubear, her Samoyed, has her own Instagram. In her spare time, she likes to code, draw, and drink milk tea.